1980 Ferrari 400i 5-Speed V-12 Burgundy with Tan interior 50,000 Miles. EPA/DOT papers. This is a very nice example of what is the best deal in a Ferrari V-12. The car came from Florida before I got it and sold it to the previous owner in 2000, it was imported in the mid 1980’s, it has EPA and DOT papers. The car is fitted with a complete Stainless Steel Exhaust. system(probably at least $5000 or more to purchase this system) which is much freer flowing than the stock system(and it will never rust) which allows this car to perform as a V-12 Ferrari really should. This is the fastest, strongest running example of a 400i I have ever driven. 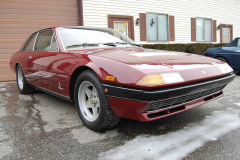 It feels more like a Ferrari 365 GTB/4 Daytona than a 400i! I sold this car about 13 years to an owner who took very good care of it, he had a full major service done at one of the best shops in the Northeast(remember that these cars do not have rubber timing belts so a major on this car lasts a long time, see the receipt in the photos) and then he had it taken care of by one of the Premier Ferrari engine builders in the USA.After I got back in January. I sold the car to a car collector friend who drove it and loved it but acquired more cars for his collection and decided to trade this one back in for something else. There are many receipts documenting the service history( he did a full clutch replacement also) as well. The car is also fitted with an MSD Ignition System which also adds to the overall great performance of the car(it still has the stock ignition box in the proper area so the car looks original). The car also has recently replaced TRX tires with more than 80% tread life. The paint shows very nicely with only some very minor flaws, the interior is very nice except for the front seats which are cracking but are still soft. There are high quality sheep skin seat covers that come with the car. There is a manual pouch which also has the service book, dealer guide and owners manual along with the pouch for the manuals, these are very rare for a 400i to have. There is also a jack kit and also many receipts documenting the care that was given to the car. If you want a 5 speed 400i V-12, this is an excellent car to consider.